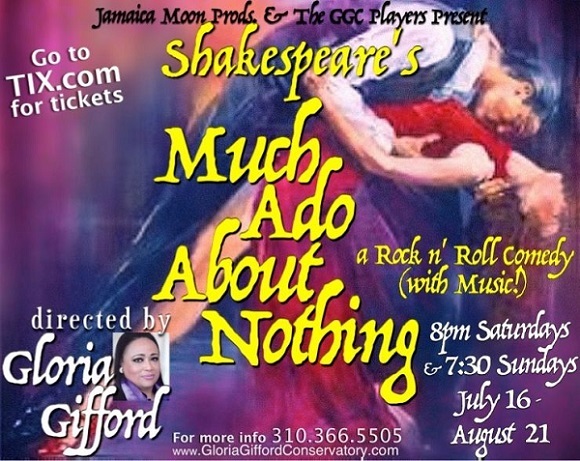 A new production of Much Ado About Nothing featuring a rock ‘n roll score will open at T.U. Studios beginning July 30. Shakespeare’s comedy of love, and the hilarity that ensues when two of his most loved characters, Beatrice and Benedick, engage in a sparring match of words. It was revolutionary for its patriarchal time period for featuring a heroine with a sharp tongue and sparkling wit. This pair would later become the prototype for characters portrayed in 20th Century film comedies by actors like Katherine Hepburn and Spencer Tracy. Gloria Gifford directs a large cast that includes Tracey Ali, Hayley Ambriz, George Benedict, Raven Bowens, Jeff Hamasaki Brown, Billy Budinich, Marlin Chan, Leana Chavez, Heather Compton, Yvette DeVito, Sonia Diaz, Chad Doreck, Justine Estrada, Joshua Farmer, Joe Filippone, Lindy Fujimoto, Dylan George, Keturah Hamilton, Chris Jones, Abigail Kochunas, Christian Maltez, Sam Mansour, Tahlia McCollum, Alex Miller, Maya Moore, Kelly Musslewhite, Benito Pajr, Nakta Pahlevan, Kasia Pilewicz, Lauren Plaxco, Antonio Roccucci, Cynthia San Luis, Deidra Shanell, Danny Siegel, Tejah Signori, Samiyah Swann, Justin Truesdale, Nancy Vivar, Keith Walker, Lucy Walsh, Jade Warner, Teagan Wilson and Sabrina Won. 10943 Camarillo Ave., North Hollywood, CA 91602. Saturdays at 8pm, Sundays at 7:30 pm.